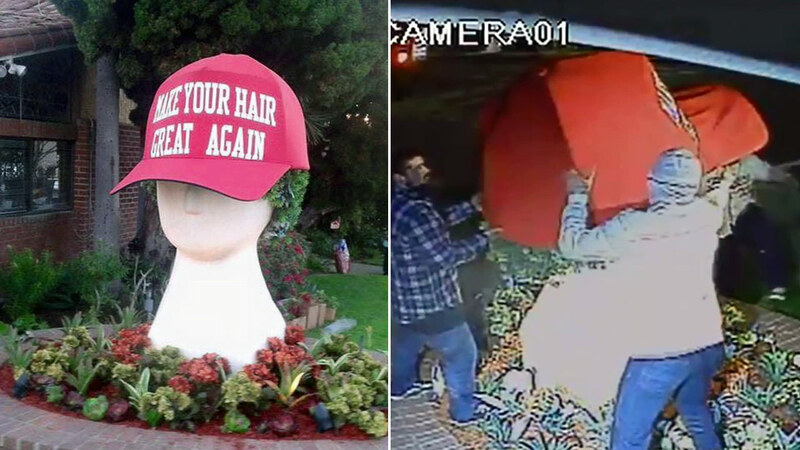 Surveillance video showed a giant Donald Trump-like hat being stolen from outside Joe Oliveri Hair Design in Redondo Beach on Tuesday, March 8, 2016. REDONDO BEACH, CA (KTRK) -- The owner of a giant replica baseball cap very similar to the one Republican presidential candidate Donald Trump wears is asking the public for help after it was stolen in Redondo Beach, California. The cap reads "make your hair great again," which is a play on Trump's campaign slogan, "make America great again." Surveillance video showed the cap being stolen from outside Joe Oliveri Hair Design in the 1400 block of Pacific Coast Highway on Tuesday. Three suspects were seen lifting the hat of the topiary sculpture of a head and running away with it. "I hope they find out who did it and make an example of them," owner Joe Oliveri said. "I mean there's just no purpose to it. I don't know what they attempted to accomplish by doing it, but it's very disappointing." Redondo Beach police said the three suspects were seen driving away in a black four-door car with the hat on top of the vehicle. Oliveri said the hat is not a political statement and stated that it's worth $2,000.